Green Day always were a pop/punk band. Now, these Warner cash cows are so slickly produced that it's just "pop" -- no "punk" really! At least, if you accept that Fugazi are the Punk Rock Godz of the USA (with their liberal political stance, veganism, straight-edge-ness, and anti-corporate structure stances), then Green Day are just another pop band. So Green Day are a punk band. One that got a major label contract, have sold millions of records, and yet, they bring queer-core bands on tour with them to raise awareness of homosexual rights issues. They take a firm, anti-drug war stance (well, actually i guess their stance is more pro-pot use, but the net result is the same). So i dunno. I can't judge them. Call them sellouts if you will, but millions of people have heard Green Day, while there are probably a few people reading this and thinking "Who is this 'Fugazi" he is talking about?" So there you go. Okay, enough political ranting for now -- let's talk about MUSIC! For this, their 6th CD, Green Day have decided to experiment with some different instrumentation: acoustic guitars, harmonica, mandolin, accordian, farfisa (i don't even know what that looks like!). I give them kudos for trying something new, for attempting to break out of their simple "three chords and shouting" idiom. Heck, it's worth a shot! And like i said, this album is so slickly produced that, well, it works for the most part. Billy Joe's acoustic strumming sounds good with Mike Dirnt's bass riffs and Tre Cool's drumming. Or accordian, or whatever. 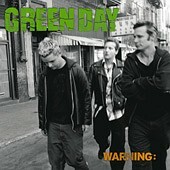 The fact is, these songs are as bouncey and enjoyable as anything that Green Day have done before. The bulk of the tunes on the album are very radio-friendly. Castaway even features that "hand-clap" sound that was so prevalent in the 1980's. Oh yeah! I must admit that some of the songs sound, well, less than entirely original. For example, the opening guitar riffs on Church On Sunday sound ripped straight from London Calling! And there is a harmonica bit on Hold On that sounds like Love Me Do by The Beatles. Not that any of this is bad. I just always feel cheated when i can so clearly recognize what influenced an artist at a particular point. Anyway, it all works. The harmonica sounds a little cheesey, but that's okay i guess. But, to me, the most interesting tune is Misery. This song features the farfisa Mike Dirnt appropriated. I don't know what a farfisa is, but it sounds kind of like a circus organ. Anyway, the farfisa is used to create some eerie sounding instrumentation which is layered behind some dark lyrics about drug abuse. I find this song content odd because of Green Day's stance as marijuana advocates. Perhaps they are disillusioned about their drug? Or, perhaps .... well it would be possible to interpret the song as indicating that only pot can make this terible life worth living. But that's a little too bleak, even for me! I dunno what they were thinking. However, i am drawn to this tune each time i listen to the disc. There is something there, something different that shines through. It also sort of puts the lie to the rest of the album, which is all shiney and happy. I dunno, i can't figure this one out. But most people will probably skip that one! Okay, to sum up: new Green Day = very listenable. Light and happy on the surface with one song that descends to the depths of despair. Buy. Listen. Bounce.